Christopher Malloy rode his tractor two blocks from his Elliger Park home to Fort Washington Elementary School on Oct. 8 to pick up his daughters. He was warned by police and school officials not to make a return trip. Christopher Malloy is not a big fan of nanny bureaucrats, especially when it comes to his kids. He has a history of pushing back when it comes to weighing common sense against rules he questions. 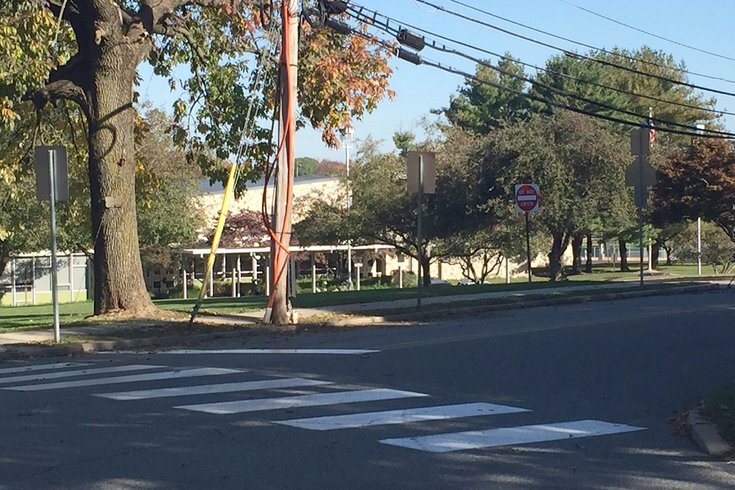 Which pretty much explains how a two-block ride he took on a suburban sidewalk to pick up two of his daughters and then ferry them home from Fort Washington Elementary School has grown into Tractorgate since it happened on Oct. 5. Seems the bureaucrats have won. Police have threatened citations that include: unrestrained passengers, operating an unlicensed, unregistered motor vehicle, operating a motor vehicle other than a wheelchair on the sidewalk, Malloy wrote on Facebook Thursday afternoon. “If there is something more dangerous about the tractor than kids walking themselves home or riding their bikes or being ferried in behemoth SUVs, I will drop it. But ... I am not seeing any dangers. I am only seeing people who spook too easily and feel entitled to dictate how others should behave.” – Christopher Malloy of Fort Washington, on Facebook. And police warned that penalties for those infractions could include suspension of Malloy's driver's license, he added. Malloy, an Elliger Park resident, took the death of his suburban hayride with good humor, calling it a "First World Problem." "If you are angry and want to do something, go give blood. redcrossblood.org will point you in the right direction. It doesn't cost you anything and is much more constructive than an angry post." He closed by saying: Have fun. Be nice to people. Do good things. Be curious. Stephanie Hultquist, the elementary school’s principal since 2012, apparently sent a scolding message to the Malloys on Oct. 6 telling him to stop after the lone tractor ride. Hultquist then apparently ratcheted up, invoking the prospect of local police intervention. Malloy then posted on Facebook. The story has taken off with a loud Internet buzz and attendant national media attention. But the superintendent, Deborah Wheeler, did not respond on behalf of the school. “The safety and well-being of the students of the School District of Upper Dublin are our primary concerns. “The lawnmower with the attached cart and wagon was driven by a parent to school during a time of day when both pedestrian and road traffic are at their peak. Our ultimate concern is connected to the safety of those in proximity to the vehicle." Hultquist did not respond to a follow-up request for a telephone interview from PhillyVoice. She did, however, say in an emailed response that Upper Dublin police had met with Malloy on Wednesday evening. Terrence Thompson, Upper Dublin’s police chief, did not respond to requests for comment. Malloy, a certified registered nurse anesthetist at Hahnemann University Hospital in Center City, also did not respond to a request for comment. But he laid out the event in some detail in his Facebook post on Oct. 7. “I was able to pick up my girls from school in the lawn tractor and have a hayride back home. The weather was perfect, the motor needed to warm up before an oil change and the wagons were empty of tree limbs, pavers, and whatever else I cram in there. “I fired up the tractor, threw Gabriella (his youngest child) in a wagon and puttered off to FWES. “On the way (took a while at my top speed of ~6mph) I got smiles and waves and thumbs up and plenty of puzzled stares. “I rolled up to the pick up line and let them know who I was picking up. The girls came out and were ecstatic. “I started to pick up on some really odd vibes coming from some of the adults (teachers? staff?) around the pickup line. I didn't pay much attention because I was herding three girls who were excitedly showing their friends the hayride they were about to go on. “I gave her a puzzled look because in a parking lot filled with two ton SUVs and small children, I don't agree that my 18hp lawn tractor posed a significant risk. “The ride home was a blast and the girls (and I) were super excited to do it again. “Today I got an email from the principal of FWES telling me that I wasn't welcome to repeat the activity. I have sent an email back asking for clarification. “If there is something more dangerous about the tractor than kids walking themselves home or riding their bikes or being ferried in behemoth SUVs, I will drop it. “His then-six-year-old could swim like a fish, she was awesome and it was inspiring to the smaller girls. “A lifeguard approached us and informed Chris that because his daughter wasn’t wearing a bracelet that indicated having passed a swimming proficiency test, she would have to wear a life jacket. “This at the time seemed ridiculous given her way above average swimming ability and she was really disappointed, almost in tears, she had obviously worked really hard to be that comfortable in the water. “Chris tried to explain that his daughter had been well trained (which was obvious) but his words fell on deaf ears as the policy makers and lawyer’s rules trump all. “I was blown away, he does not back down when advocating for his children for any reason. “As a younger and less experienced dad, I knew in that moment, that this was the kind of dad I wanted to be. Chris’ fortitude in his code of living, in making the world a more curious and exciting place for his family and friends is something that we should all aspire to, I am proud to be his friend." While Malloy had not yet taken another hayride before hearing from police, he had purchased a bright orange triangle for the back of the lawn tractor – one he apparently no longer needs.